A few months ago, I read something that shook me out of my complacency. I came across an article where Barbara Streisand condemned Israel for discriminating against women and not allowing them to pray at the Kotel. As I read more, I found a description of Women of the Wall (WOW) and their efforts to liberate the Kotel. This article stated that a group of women were being excluded from praying at the Kotel, the remaining Western Wall of the Holy Temple. 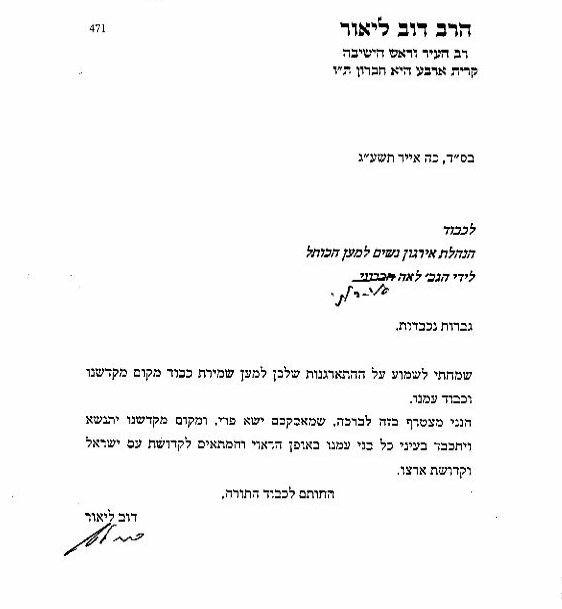 It stated that misogynistic Rabbis were discriminating against Jewish Women and had arrested them for praying. I was horrified. This did not make sense to me as on my trips to Israel when I visited the Kotel weekly, I was never excluded from praying. I began to research WOW and learned about their leaders and their financial backers. I found out that for the past 25 years, the WOW group has consisted of a small group of women, anywhere from 50-200, who believe they represent “pluralistic” prayer and a new face for Jewish women. They come to the Kotel, once a month and conduct a loud, colorful, non-traditional, often disruptive, prayer service, accompanied by a large media circus and 50-100 angry protestors. I found much of the media coverage of this story extremely critical of Traditional and Orthodox Jewry. The majority of the articles I read made it sound like in traditional Judaism, men do not allow Jewish women to pray at all. While others made it sound like men throw bottles and eggs anytime women want to pray at the Kotel. I also found the portrayal of Traditional and Orthodox Jewish women personally offensive. We were being portrayed as mindless followers who had no opinions of their own. The more articles and Op-Eds I read, the more incensed I became. I wondered how can anyone think that I was a mindless follower? That all the wonderful, traditional, religious women I interact with daily and have known throughout my life are subjugated, almost as if they are suffering from a collective, worldwide Stockholm Syndrome that has spanned millennia? I have always thought of myself and my peers as intelligent, educated people. Every choice I have made for myself and my family has been made consciously, with my full heart. The more I read the American and Israeli media, the more I realized that the voice of Traditional and Orthodox Jewish women was not being represented at all. A small group of women, with ideals contrary to mine, were claiming to speak for all Jewish women, but their voice was not representing my ideals and beliefs. I began to feel the need to speak out. In my readings, I found out about Women for the Wall (W4W), a grassroots organization that has emerged to protect the sanctity of the Kotel. When I saw how in just a few days they were able to get the backing of our biggest Rabbanim and Gedolim and get thousands of women to come to the Kotel to pray, I was inspired. 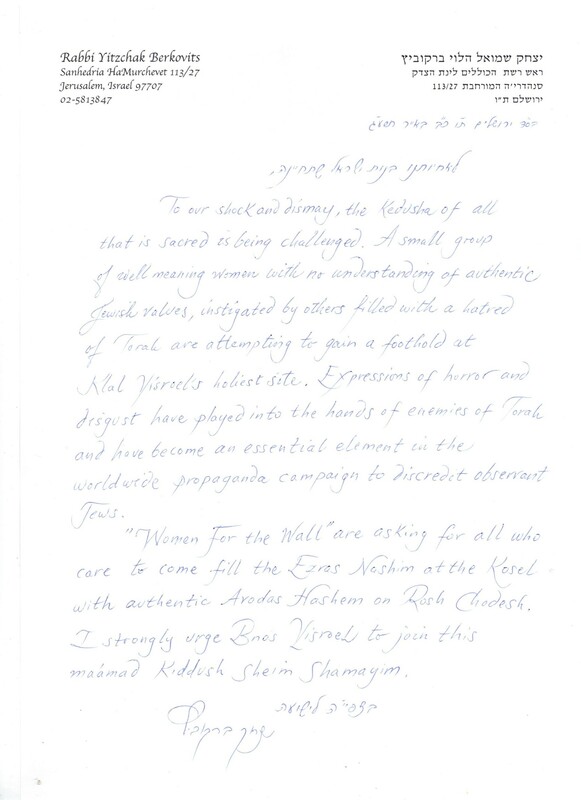 When I began to read the Op-Eds by Women for the Wall members and their supporters, about Feminism in Torah Judaism and the special role that women play in the traditional Jewish lifestyle, I felt like Women for the Wall was giving me and the thousands of Secular, Traditional and Orthodox Jewish Women who respect the status quo at the Kotel a unified voice. When I saw the thousands of women and girls praying quietly at the Kotel on Rosh Chodesh, I saw myself, I saw my daughters and granddaughters. This is our voice. This is our Kotel. Read the full article at Times of Israel.